Record signing Chris Wood is rated as “touch and go” for Monday night’s televised Premier League clash with Newcastle United at Turf Moor. The New Zealand captain came off on Saturday in the 3-0 defeat at leaders Manchester City with a hamstring problem. 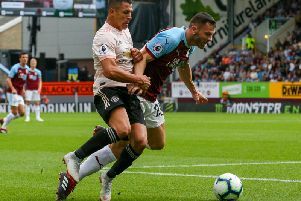 And while the extra couple of days could make a difference to his availability, boss Sean Dyche said: “Woody has a chance, but he is touch and go for Monday. And Nahki Wells could come into the equation should Wood and Vokes not make it, after again completing 90 minutes for the Under 23s on Monday night as he returns from an operation to remove a screw used to pin a previous injury 10 years ago. The £5m deadline day signingg hasn’t played since Huddersfield Town’s Championship play-off final win, but Dyche said: “We wouldn’t want to rush him, and he ideally needs another game – it’s like pre-season for him and he hasn’t played since the end of last season. Dean Marney also came through an hour at Curzon Ashton as he continues his recovery from a cruciate knee injury suffered in January, while forward Jon Walters is “beginning his journey back” to fitness after a knee injury. He is expected to miss the Republic of Ireland’s World Cup play-off games with Denmark next month. Burnley go into the weekend eighth in the Premier League table, with Newcastle United seventh after an impressive return to the top flight under Rafa Benitez. And Dyche expects a difficult evening: “It seems to me the biggest breakthrough for Newcastle was the transfer window closing, and everything seemed to calm down, and they could get on with it with the players they’ve got. “They have a good solid structure and shape with Rafa, which he is renowned for, and he has good players – players who want to do well in this division. “It will be a difficult game, as they all are, and we will have to be on top of our game again.